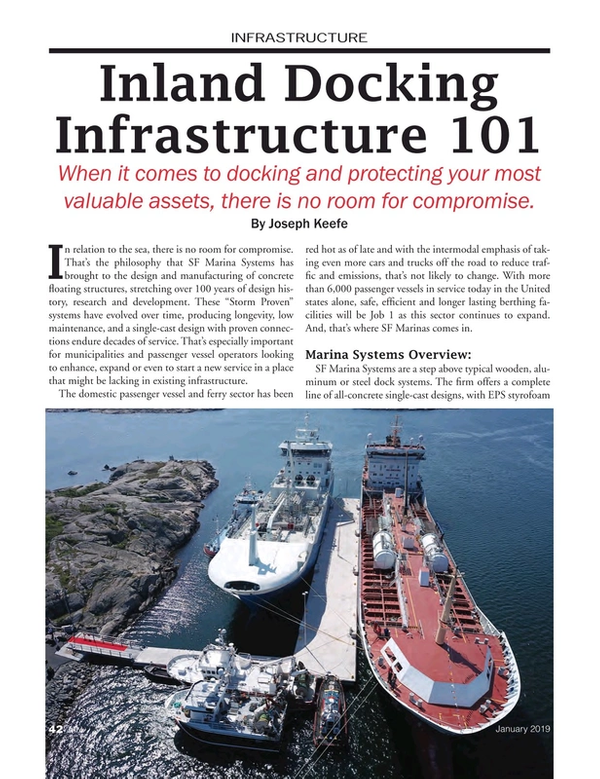 When it comes to docking and protecting your most valuable assets, there is no room for compromise. In relation to the sea, there is no room for compromise. That’s the philosophy that SF Marina Systems has brought to the design and manufacturing of concrete floating structures, stretching over 100 years of design history, research and development. These “Storm Proven” systems have evolved over time, producing longevity, low maintenance, and a single-cast design with proven connections endure decades of service. That’s especially important for municipalities and passenger vessel operators looking to enhance, expand or even to start a new service in a place that might be lacking in existing infrastructure. The domestic passenger vessel and ferry sector has been red hot as of late and with the intermodal emphasis of taking even more cars and trucks off the road to reduce traffic and emissions, that’s not likely to change. With more than 6,000 passenger vessels in service today in the United states alone, safe, efficient and longer lasting berthing facilities will be Job 1 as this sector continues to expand. And, that’s where SF Marinas comes in. Marina Systems are a step above typical wooden, aluminum or steel dock systems. The firm offers a complete line of all-concrete single-cast designs, with EPS styrofoam cores and protected steel reinforcements. The heavy mass of the structures offer stability and longevity. They are low maintenance, and accommodate high vessel and environmental forces; including high winds, waves and harsh winters. A complete line of heavy duty, all-concrete single-cast designs with an EPS styrofoam core and protected steel reinforcements is bolstered by heavy mass and thick walled concrete structures to offer stability and longevity. These systems are designed to be low maintenance and accommodate large vessels and environmental forces, including impacts, high winds, waves and harsh winter ice. From tenders, to large tugs fishing vessels, ferries and super yachts, this could be your ‘unsinkable’ solution. Standard units can be shipped world wide and moored with a variety of anchoring systems with infinite lengths. The low maintenance and heavy mass of the concrete structures are well matched to large tugboats and super yachts. Looking ahead, the next advancement will be the use of non-metallic reinforcement for the floating concrete structures. The use of basalt rebar is a significant advancement that will greatly increase the lifespan of concrete docks that will last a century. Mere utility only goes so far, though, especially in urban settings where municipalities gentrify crumbling waterfront space to accommodate a new generation of waterborne commuters. To that end, SF Marine Systems structures are aesthetically pleasing to view and feel under foot. Customized with wood and composite treatments and a thick deck surface to accommodate internal utilities, lighting, high-loading cleats and bollards, and small cranes, there is a breakwater, dock and/or finger system for virtually application imaginable. When the Yorktown National Park was in need of a large vessel pier for visiting transient boats, small cruise ships, regional tour boats and tall ships, they turned to SF Marina Systems. The depth of the water, sharp drop from shore and fierce currents inhibited a fixed pier solution. SF Marina Systems and Coastal Design and Construction developed a less costly all-floating system which could accommodate up to 400’ vessels with 55 mph squall conditions. For more exposed ports and berthing areas, SF Marina Systems also manufactures a floating breakwater system. The geometry of these pontoons, in combination with a patented coupling and an advanced mooring system, makes this floating breakwater an excellent wave attenuator. Developed gradually over the years, The breakwaters from SF MARINA are all-concrete pontoons with all the advantages of high stability and buoyancy that make these units virtually unsinkable. Scalable to virtually any size application, SF Marina Systems are in use, providing robust service for tugs, super yachts and ferries. One such arrangement, located near the SF Marina Systems factory in Sweden, is comprised of high freeboard (5 feet) berths that serve as a home port for three 1,100 ton Tug boats. The massive single cast units are 10 meters wide and 2.4 meters tall and weigh over 240 metric tons each. They can be combined together to create unlimited lengths, with pile moored solutions as well as chain mooring. Integrated into the utilities systems are power, water and sewer systems for the vessels. 30-ton bollards are cast into the structure and the customizable cast concrete fender blocks allow the buoy fenders more contact area to cushion the tugs during stormy weather. The reinforced deck and bridge ramp is designed to carry loaded commercial trucks allowing supplies to be craned on to the tug boats, and for Fuel truck deliveries. For the thrifty shortsea service provider, this Floating pier system is a acceptable alternative to fixed pier structures for both commercial vessels and super yachts alike. SF Marina Systems USA (SF USA) is based in Gloucester, VA and is partnered with SF Marina Systems International in Gothenburg, Sweden. SF USA is part of a worldwide network of specialists selling and producing concrete floating structures. The company’s heritage dates back to 1918 in Sweden, where the early designs and product development began. Over time, SF Marina has delivered more than 1,000 marina systems of varying shapes, sizes and applications worldwide. SF Marina calls their time-tested, combined experience and knowledge base the ‘S.A.F.E. Marina system.’ SAFE stands for Secure, Adapted, Flexible and Environmentally friendly. If longevity, low maintenance, and a storm-proven connection system intended for decades of service is what you are looking for, then SF Marina Systems might just be the place to drop anchor. Almost 75 years after British Royal Engineers built a complete Mulberry Harbor out of 600,000 tons of concrete that contained 33 jetties, 10 miles of floating roadways to land men and equipment in the choppy wake of the D-Day landings, that effort is still commonly pointed to as one of the best examples of engineering of this century – military or otherwise. The remains of those historic structures are still visible today from the beaches there. Similarly, the SF Marinas system of today, developed through a century of R&D, will also be around to see in another century. Chances are, you’ll use one, along the way.